Sometimes when one has been a catechized member of a Presbyterian Church all their lives, or at least the part of their lives that they can remember, reading theology books may seem like a pat on the back or a sort of sanctified echo chamber. Not that they are unhelpful because all of us need to hear the good news and the beautiful doctrines that uphold our beliefs, but often it seems we read what we know we already agree with and finish with a pleasant feeling of agreement. 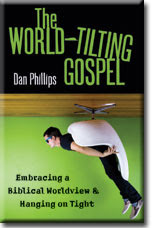 With similar expectations, I picked up The World-Tilting Gospel by Dan Philips. I had never heard of Dan Philips before, but I noticed one of the endorsement blurbs was by John MacArthur, so I figured I was in good company. Philips’s purpose is summed up well by his own subtitle: Embracing a Biblical Worldview and Hanging on Tight. The last chapter brings all these parts together into a culmination that sums up the biblical worldview in a beautiful and breathtaking way, making you want to stand up and shout your love for an amazing God. Now, I won’t say my expectations were totally blown out of the water, in that Philips doesn’t say anything I really fought against or struggled over, but he presents truths of the gospel in ways I’ve never even considered. Even this inveterate lover of doctrine and reader of the driest of the Puritans, learned something from this book! He succeeds in taking the whole of God’s plan leading up to the cross and how it affects and should affect us, and presenting it in all its mind-blowing, messy, and miraculous beauty. This is no new gospel Dan Philips presents. He just uses scriptures, other theologians, humor, and his own deep love of Christ Jesus to again proclaim this priceless good news. “The World has tried to do all sorts of things with Jesus. It has tried hard to ignore Him. Eighteenth-century radicals tried to make Him a mythical figure, until the spade of the archaeologist rendered that endeavor intellectually absurd (That news hasn’t reached the somnolent chambers of the Jesus Seminar, which thrives on the ignorance of the public at large, and the shallowness of the pulpit. )…Failing all that, the world has repeatedly tried to mash Him into its image for its own endeavors – as political/social revolutionary, hippie, sage, philosopher, champion of ___rights, anti-establishment, iconoclast, eco-warrior. It tries to tame Him, control Him, cage Him. The world needs to know the truth about the Jesus who won’t be ignored, tamed lassoed, or co-opted. It needs to hear about Him in all His raw, rude, gate-crashing, table-bashing power. It needs to hear about His nature, His cross, His resurrection, His crown, His warnings, His demands, His offer. This book has a real emphasis on the Bible. Philips digs deeply into the entire Bible, literally from Genesis to Revelations, and brings up so many priceless words from the Lord. He takes things like sin, the sovereignty of God, and our own helpless condition and shows who we really are and why grace is so necessary. The issues that the modern evangelical church constantly avoids in an effort to "be less mean," he exposes as an integral part of our real life (dare I say it) happily ever after. And if all of that hasn’t convinced you to read this book immediately Philips is an amazing author. He has a winsome way with words, a “warped sense of humor” (his words not mine), and an appealing style. There are certain passages where I thought perhaps he was taking his humor a little too far and bordering on the flippant. Also, when he lightly touches on some of the false doctrines in the church some of the language he uses is mainly dismissive and slightly insulting. “But these doctrines are obviously stupid and deserved to be mocked,” my fellow reformers might say. Well, yes, I agree in theory, but I don’t think it’s necessarily the best way to win friends and influence people. For example, he uses the term “Evanjellybeans” to describe modern evangelicals who have compromised the gospel in order to make it fit the world or make it more appealing. If you didn’t laugh at that, or at least chuckle or smirk, you might want to check your pulse. BUT if you ARE an Evanjellybean you might be offended by the word and not listen to the rest of what he has to say. I will be buying it for two friends (one of whom says she is a believer, but only if it doesn’t interfere with her life) for Christmas this year. And if that doesn't convince you to find a copy yourself, I don't know what will. It should be duly noted that Heather read my review copy of this title, which was provided to me by Kregel Publications. She then did purchase her own copy (along with the others she mentioned) which convinces me that this book must be read. I've heard great things about this one, and snapped it up for free (Kindle) on Amazon a while back. I haven't gotten to it yet, but I hope to soon. As a (possible? Probable? I'm not too good with labels) Evanjellybean, I think this sounds like a must-read! Sounds very good! I wince when humor goes a little too far, too, and agree that it can be offensive in situations like you mentioned.